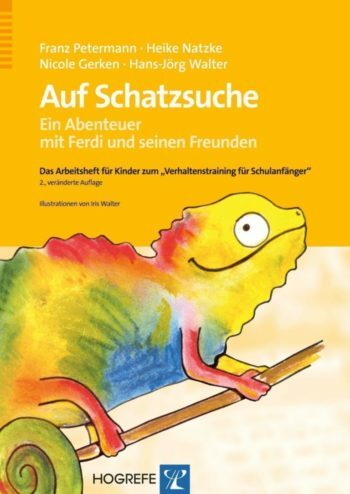 On a treasure hunt – An adventure with Ferdi and his friends. The» Behavioural Training for School Beginners «is a group program for the targeted promotion of social and emotional skills. It was specifically designed for children in the school entrance phase who can’t yet read and write. The training can be carried out in school, in other educational institutions as well as in a modular way in the child psychotherapeutic setting. This workbook has been specially developed to support training. It contains all the necessary working materials. The attractively designed image materials can be painted. In addition, there is enough room for your own ideas on designated worksheets. The training tasks are embedded in an age-appropriate frame action: The children embark together on an exciting treasure hunt. They are accompanied and supported by the chameleon» Ferdi «. In their adventurous search for an old pirate treasure, the children encounter numerous fantasy figures such as the tree fairy Cordula by Eich, an oracle, ghosts and a dragon. In addition, with the help of short comic representations, they are confronted with peers who have to deal with social problem situations.